Yes, this is New York City and yes, we have fishing too. On my recent excursion to Coney Island, we made the requisite trip to the pier from the Coney Island boardwalk (I have seen it referred to as Steeplechase Pier). There are actually many spots around the city, even Manhattan, where fishing is permitted and with the waterways becoming progressively cleaner, much of the fish is now edible. 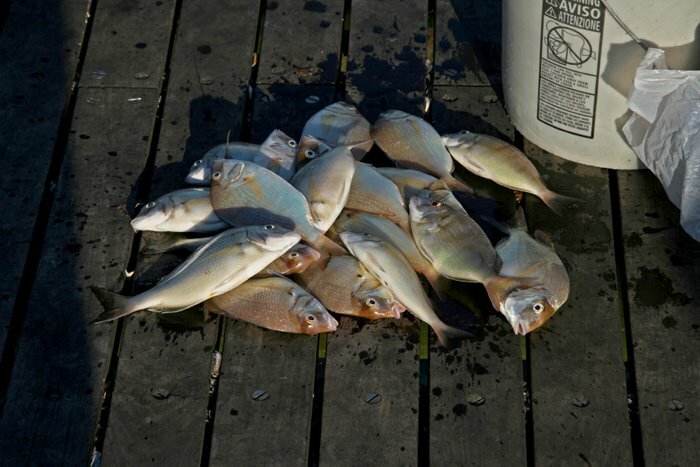 This catch of Porgies was being sold for $10. I see that it is a relaxing way to spend a beautiful day amidst the natural elements - sun, sand, sky, water and fresh sea air. Although the sight of dying fish is not the most pleasant one, this is perhaps more shocking to the city dweller who is very divorced from the entire process of bringing fish and meat to the dinner table. After all, fish don't just appear filleted on a dinner plate - they need to be caught, cut and cleaned. Many urbanites have probably never even witnessed anything other than fish being cooked and served. Baiting is part of the process too and the pier was dotted with fishermen cutting fish for bait or putting their catches into plastic pails - see photo here.